"Heaven is likeness to Jesus Christ; and likeness to Jesus Christ is undying sympathy with the lost; is love unquenchable towards his worst enemies. But the heaven which the traditional creed...offers to us is a thing so hardened, so awful that merely to think of it fills the mind with horror. Deadened sympathies...pity forever withered...'it is a mystery,' they reply. It is hell, I answer, disguised as heaven." Allin begins with a powerful theme that, in our own day, Robin Parry has extensively developed: "We shall find-and the fact is a striking confirmation for the larger hope-that the great verities of our faith grow into a living unity in the light of the great purpose of restoration. Creation, incarnation, resurrection, judgment, etc., thus assume their places as parts of one great whole, the 'one thought of the one God.'" The church Fathers for the first few centuries wrote and spoke in Greek, and this was the time period when belief in universalism was widespread. But as the Italian churches rose to power and Greek became an unfamiliar language, "no obstacle was left to stem the fast rising tide of Augustinianism, naturally triumphant in an age cruel, corrupt, and superstitious...the whole framework of Western theology, to its infinite loss, bears to this day the imprint of... [this] pitiless creed, which slanders at once God and man..."
Allin's objective is to "show clearly how groundless is the widespread opinion that represents universalism as the outcome of modern sentimentality, and will establish clearly: (1) That it prevailed very widely in the primitive church...(2) That those who believed and taught it...were among the most eminent and the most holy of the Christian Fathers...(3) That it not only has never been condemned by the church, but is, far more than any other view, in harmony with the ancient catholic creeds." Hell, Allin points out, is incompatible with two key revealed truths. First is the fatherhood of God. "When we pray and say, "our Father," these two words convey the spirit of the whole gospel...[yet] the view generally held is an absolute negation of all that the parental tie implies. "[I]f any one soul perishes, it is the man's own loss, says our popular creed. But...it is God's loss: it is the Father who loses his child. The straying sheep of the parable is the Great Shepherd's loss...the missing coin is the Owner's loss...In this very fact lies the pledge that he will seek on and on til he find it." The popular creed of hell as eternal torment is untenable, says Allin. "[A] partial salvation aims a blow at both the incarnation and the atonement. For a vital part of the incarnation is the taking of the race of man, as an organic whole, into God through Jesus Christ, the second Adam...No less vital is the blow aimed by the popular creed at the atonement. First it dishonors the cross by limiting its power to save to the brief moments of earthly life. Further, it virtually teaches that the cross is a stupendous failure...[since] the scriptural evidence is overwhelming that the object of Christ's death was to save the world." 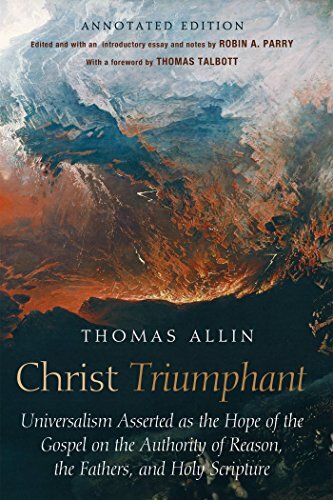 In 1885, Thomas Allin (1838-1909) published the book originally titled (and now subtitled) Universalism Asserted as the Hope of the Gospel on the Authority of Reason, the Fathers, and Holy Scripture. ..